The band brought their first UK tour to a close last night (March 10), playing their second show in a row at the Troxy venue in London. 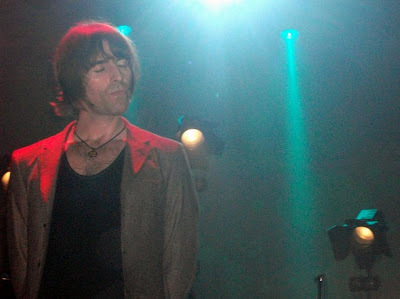 Liam Gallagher's attention turned to fashion as well as music during the show. He dedicated 'Man Of Misery' to "all the Pretty Greeners in the audience then later gestured to his green military parka and joked to the crowd: "Mine's real, yours is probably fake, innit." (of course, 'cause he copied the parka from me). And at least to me he said "nice jacket", lol. The band are now set to head to Europe to play more shows, arriving in the capital of fashion on Wednesday 16 March. Advice: avoid Paris, as something negative in Oasis history always happened (gigs erased, rude people, terrible travels in the whole france - oh! the same happened to me, how strange - , and the end too). Definitely a jinx. I will add some videos. By the way, in Milan tomorrow there's a Carnival party @ Football English pub where Liam was. On 12 and 13 March, Oasis discoverer Alan McGee for 2 nights in discos near Milan. On 14 Glasvegas concert ("Best band in the world", according to Alan). On Sunday 13 (kick off 12:30 midday) tickets at the stadium cost half price (because for us it's a strange hour to play), AC Milan vs Bari, the 1st in the league vs the last one (so probably some goals to see), and a celebration for the 25th anniversary of Berlusconi president of the most successful club in history, thanks to him.